Pork chops with toasted garlic and roasted red pepper. 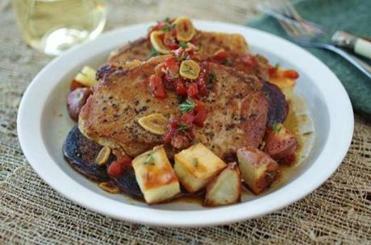 Thin boneless pork loin chops are one of the more effortless options in the meat case. Saute the chops and turn them in a simple pan sauce of toasted garlic, thyme, and roasted red pepper, finished with a little vinegar for tang. The dish has a Spanish feel. Cooking the pork properly is paramount. The chops don’t take long in the skillet and should be served a little pink, accompanied by roast potatoes. Leftover garlicky chops are a nice building block for a warm salad. Roast apples and fennel until caramelized, toss with thin strips of the pork and serve over baby spinach and toasted walnuts dressed with a shallot vinaigrette. Add a crusty baguette and enjoy the achievement of simple, satisfying food. Tony Rosenfeld can be reached at tonyrosenfeld87@gmail.com.